Harold Bowen wrote this story in Tales of Olde Ipswich. In the early 1900’s, just about everybody knew Elisha Newton Brown, better known as Nute Brown. He was a prosperous farmer who lived in the Candlewood section of town. 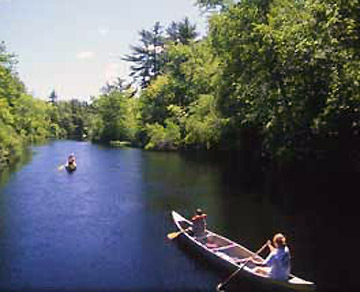 For years he was captain of the old Tossut hand tub, which was kept in Candlewood. His main business was teaming hay into the hay market in Haymarket Square, Boston. Perhaps the thing people knew most about Nute, other than his choice of vocabulary, was when he went through the Choate Bridge, sometime around 1920. 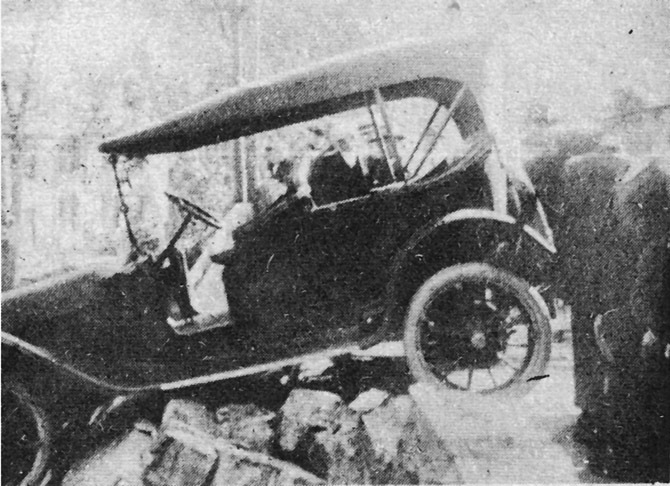 At that time, there were trolley car tracks over the bridge, and when coming into town in his old Maxwell, his wheels became caught in the tracks. The car swerved into and through the wall of the bridge. the wooden pipe house on the other side of the wall caught his transmission and saved him from going into the river. George Dexter showed up with his Camera. ” Stay right there, Nute,” he said, “I want a Picture.” “To hell with the picture, take me out,” Nute hollered. But Dexter got this picture, anyway. A group of men with a rope pulled him back into the road. Nute passed away in the early 1940’s, and I lost a dear old friend. If he were alive today, I wouldn’t dare write this story, as it was a touchy subject for him. Wendy Quigley told us about another accident in 1970 that did significant damage to bridge. 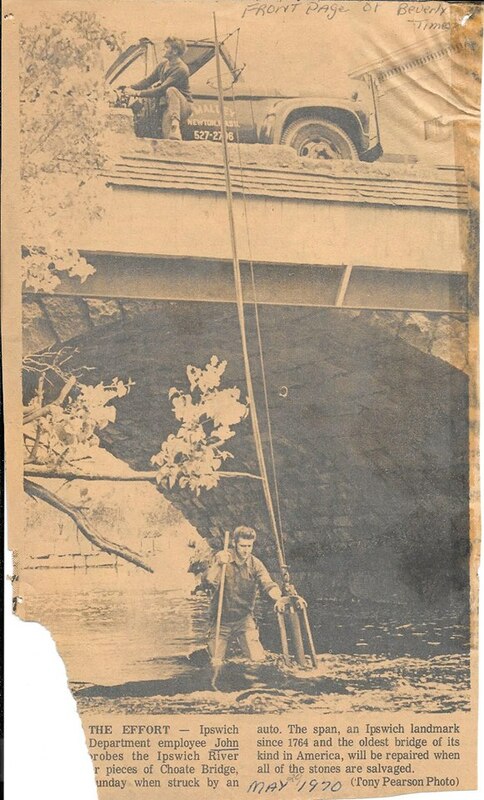 Her father, John Quigley,JR, was working for the Ipswich Highway Department at the time, and had to go into the water to get the rocks that had fallen off the bridge, so it could be repaired. 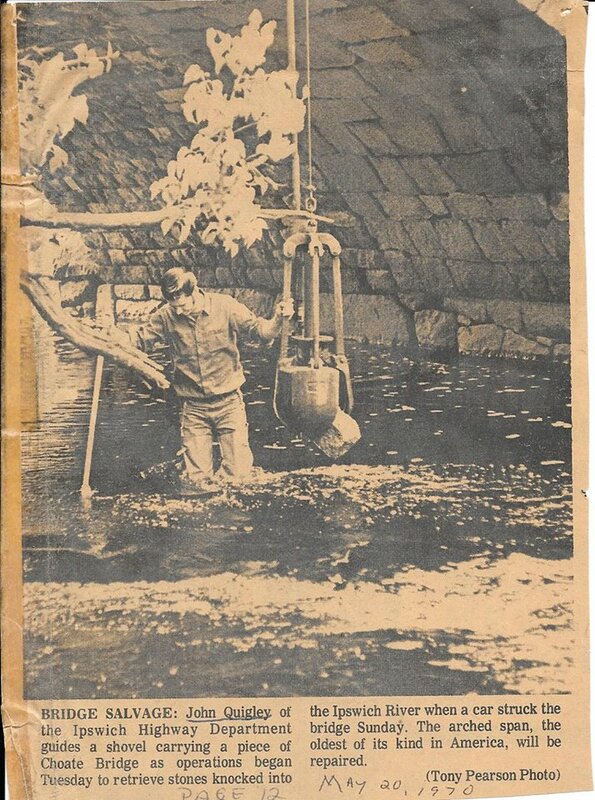 Shown below are photos of John retrieving the stones from the river, reported in the Beverly Times, May 20, 1970.